It is a natural behaviour to try to systematise things around us. When the amount of information becomes too large we try to sort it and divide it into groups. Long before Linnaeus scientists have made different systems for the living organisms. Yams, Dioscorea, are named after the Greek medical doctor Dioscorides. Photo: The Division of pharmacognosy, Uppsala University. About 300 years BC the Greek botanist Theophrastus made a system for the plants. He divided them into four groups: trees, bushes, small shrubs and herbs. Those groups were then further divided in sub groups depending on leaf shape, life span and where they grew. The system of Theophrastus included about 480 named plants. Around year 77 AD the Greek doctor Dioscorides employed the utility for mankind as a basis for a classification system. His groups included for example aromatic plants, vegetables and medicinal plants. Dioscorides' system was used in books about herbs until the 16th century. 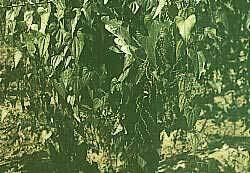 During the 16th century the number of known plants became too large and difficult to handle in the old systems. The scientists had started to be interested in the plants themselves, not only as being useful to mankind. Several new systems were presented but none of them worked really well. Something all systems had in common was that they were based on the appearance of the plants. When Linnaeus presented his sexual system in 1735 it was a most welcome change. Linnaeus is called the father of modern systematics.